Finally got my Rattata Youngster medal! Here's what it took! It takes 300 tiny Rattata to get gold in the Youngster medal. I had to catch 2678 to get that many. That makes my ratio just over 11%. Since the norm seems to be around 12%, it took me just slightly longer than normal. Anyone else get it yet it making progress? 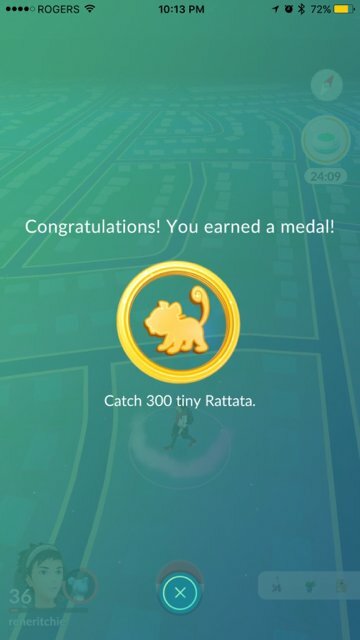 Re: Finally got my Rattata Youngster medal! Here's what it took! 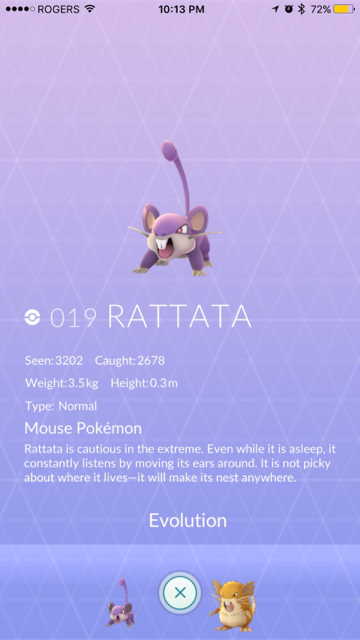 I have captured 169 Tiny Rattata (out of 1249) I went for a while ignoring Rattata because it took 3 or more regular balls to capture one - but then decided to go after the medals so I'm way behind. I haven't considered working on all of the medals till after I finished my NA dex. That was in December I think. I was similar. I went for the Dex first, then focused on building high-level Mon. Now I'm circling back for the medals. ... those may take a while. I have 29 Rattata ha ha. I haven't been trying to earn it though. Working more on building Pokémon for gyms. I'm currently on 2 'tiny' Rattata with a total of 21 caught. I don't play that often. Maybe a couple minutes every morning. Just to get the daily catch and swipe through one pokéstop :) So I've got a LONG way to go to hit @Rene Ritchie 300 'tiny' caught lol. Ill probably stop playing but hat stage. Hahaha... I'm so sick of Rattata. At this point, and I've only been playing for three months, I usually ignore them when I see them! Till December, I had a count of some 200 Rattatas, after which I left catching. Reading the above comments, I feel competitive and will start catching more of them. What do you do with all those rats when you carch them? I bet snakes would love them to eat.